Lori split off to attend Mass at St. Louis Cathedral, and the other five of us strolled back to the festival for more food. 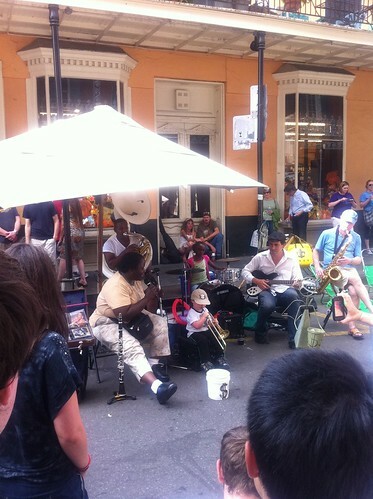 We stopped to watch a music performance that featured the cutest trombonist I've ever seen. He looked like he was only about three years old. However, although his embrasure was no doubt better than mine, he wasn't really focused on playing; he had to be coaxed to play. I felt that he siphoned some attention away from the inconspicuous nine-year-old girl playing drums behind him; she was really holding her own with the rest of the band. 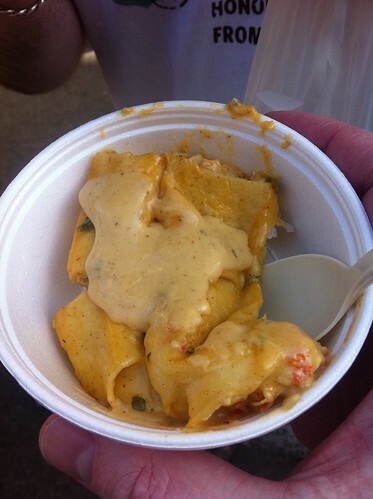 I'm not certain of my facts here, but I'll claim that Anne ordered the crawfish enchiladas with cumin mornay sauce from Blue Dog Cafe. 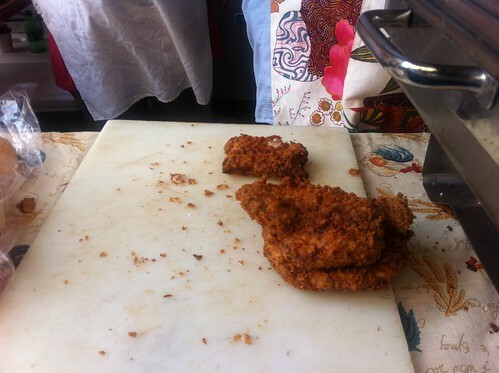 I liked these better than I did last year; the flavors seemed a bit zestier and livelier. Another non-food picture: I was struck by the costumes of this pair, and asked if I might take their picture. Lisa (the one on the left) explained that they'd been participating in a run-and-follow-clues event across the city, and the costumes were adding to the fun of that event. Lisa's wearing a nametag that says "Sue" with a circle-slash over it, and her partner is wearing a nametag that says "Nami" with a circle-slash, for a punny reading of "No Sue Nami". Their costumes represent waves. I believe that Sue is holding a soft-shell crab po-boy from Oceana Restaurant, and Nami is holding the husk of a tamale from Tucson Tamale Company. 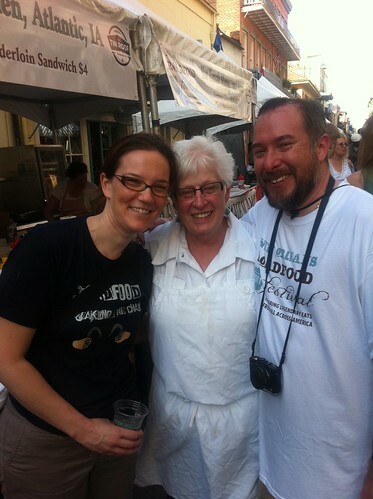 Chris and Amy introduced me to Charlene Johnson of Farmer's Kitchen, and I really enjoyed chatting with her. I remember her talking about her struggles to find a way to bring her highly-praised sour cream raisin pie to the festival (sadly unsuccessful, alas). One of these three pronounced that the right way to eat a pork tenderloin is with mustard and pickles. I tried it that way, but I didn't add enough condiments to alter the fundamental gentleness of the sandwich.